At the outset of your pub project, absolutely the most important decision you will make is what you want your pub to look like and who is going to interpret your thoughts and design it for you. Remember that if you get either of these decisions wrong, your project may be at risk right from the outset. So this stage must be researched…go and visit as many of the pubs on our list as you can, understand the features you want in your pub, understand the ambiance you want to create. Replicating the look and feel of an authentic pub is a very highly-skilled design job, and not one that can be executed well without a lot of experience. 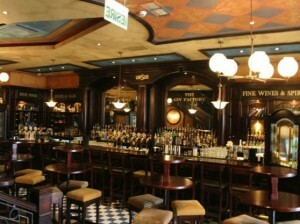 Many restaurant designers will try to convince you that they know how to blend all the elements of a great Irish Pub for success, but you should be careful in who you choose, because the results can be devastating for your success if they get it wrong. By the same token, you should only choose a design/build company that has excellent references and is preferably a partner to The Guinness Irish Pub Concept©. Because the work is so specialized, the Irish Pub Design & Build partner will usually manufacture the mill-work for your pub in Ireland and then ship it to North America. There is no better authenticity than your pub having come from its home country. Not only that, but this process is actually less expensive and far more efficient than having it done locally and we can explain this to you when we discuss your project. On the vendors’ page on this website, you will find links to a number of firms who specialize in the the development of most aspects of an authentic Irish pub, from interior design to kitchen design and across all operational requirements. Each of these vendors is a partner to the Guinness Irish Pub Concept and has been involved in developing authentic Irish Pubs for many years. We recommend that you research each company, talk to their owners or representatives, gather references from their former clients, and when possible, take time to visit and experience examples of the pubs they have created. This way you can begin to develop a comfort level not only with their style of design, but also with the way they conduct business and how well you think they will work with you. The advantages in using a specialized design and build firm for your project are many, not just because of authentic design, but also because of cost, efficiency and on-time completion. By hiring one of these firms, you simplify the project management, work with fixed pricing contracts, reduce the development timeline substantially and deliver the project as envisioned.